By BrIan Hoban, Local Guide. 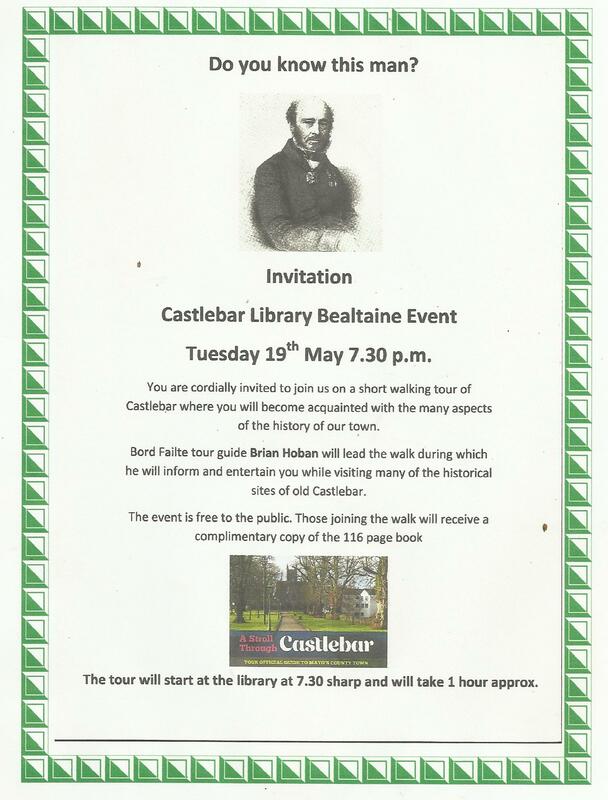 As part of this year's Bealtaine Festival (celebrating creativity as we age), Castlebar Library cordially invites all, to join us on a short walking tour of Castlebar on Tuesday, 19th May @ 7.30pm. This is an opportunity to become acquainted with the many aspects of the history of the town. Bord Failte tour guide Brian Hoban will lead the walk during which he will inform and entertain you while visiting many of the historical sites of old Castlebar. The event is free to the public and those joining the walk will receive a complimentary copy of the book; ‘A stroll through Castlebar'. The walk will start at the library at 7.30 sharp and will take about one hour. See you there. "Is Caoineadh Me an Rothar" agus "Mo Rothar Dearg"
A Passage to India or the Leaving of Liverpool.